October | 2013 | Himmel Attack! 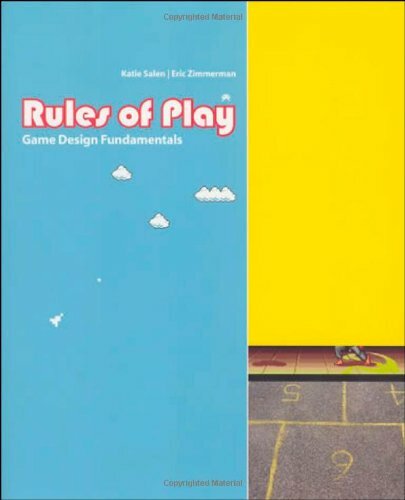 Rules of Play: Game Design Fundamentals was written by Katie Salen (who co-created Quest to Learn) and Eric Zimmerman (from the NYU Game Center). Its is a BIG book, by which it means it covers a lot of ground, but also that is very long. I have to that I wish it went about twice as fast it does. But perhaps I’m not the target audience, as I already know a lot of material covered from other places. Also, I’m not as interested in game studies as I am in design and development, and so chapters on “games as culture” don’t exactly float my boat. My favorite part of the book is the game design challenges/exercises, which include the excellent Exquisite Corpse Game Game, which I’ve gotten a chance to try out at Gamelier and found it a lot of fun. There are also some new games, commissioned just for the book, and include essays by the creators explaining their design path and choices. I can’t wait to playtest them. Page 34: The notion of meaningful play encompasses the principle that players should be presented with choices that have a impact on the future of the game experience, and that players understand this (implying a tight feedback loop). 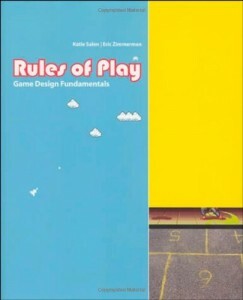 Page 63: In order to analyze how meaningful the choices presented to the player are, they can analyzed in terms of: what happened just before the player was given the choice, how was the choice conveyed to the player, how did the player make the choice, what was the result of the choice, and how was the result conveyed to the player. Page 91: The four traits that distinguish video games are “immediate but narrow interactivity”, “manipulation of information”, “automated complex systems”, and “networked communication”. Page 155: The complexity of games can be analyzed as lying along a spectrums: fixed (meaning no complexity), periodic (a simple cycle), complex (the sweet spot), and chaotic (essentially random). The goal is to make a system that is truly emergent, neither random nor unrelated to the interactions of the system itself. Page 224: Feedback loops affect games in different ways. Negative feedback stabilizes the game, and positive feedback destabilizes it. Negative feedback prolongs the game, whereas positive feedback ends it. Positive feedback magnifies early successes, and negative feedback magnifies late ones (an interesting insight that I hadn’t grasped before). Page 268: Players can be categorized in terms of how and why they break the rules. Unsportsmanlike players and cheats violate rules where they can in order to win. Spoil-sports simply don’t care about the rules, nor about winning! Page 425: Ace of Aces was a two-player dogfighting game created as a picture book! Like a choose-your-own-adventure, except each player sees a hand-drawn picture from the point-of-view of the cockpit, and picks from a large set of maneuvers. Both players announce their moves, then turn corresponding pages in their books to find out what happened. You could even play by yourself! Page 450: The “immersive fallacy” is the idea that video games are moving towards a completely immersive experience of 3D sound and video and touch and smell, as portrayed in TV and movies (The Matrix, Star Trek, Caprica, etc.). Instead, the authors argue that gamers are always playing on several levels, including meta ones in which they know they are just playing a game, and that’s a lot of fun of it. Also, a lot of media can be “immersive” without overloading the senses- like books! Page 546: The “icehouse set” are a bunch of plastic pyramids that have spawned a whole bunch of new games, all “free” once you have the set of pieces. Books have been written describing the games. Page 581: Suspicion was an unpublished game to be played over time in an office. Each player gets cards assigning them to two groups: one sect and one institution. They can team up with either of the two in order to win, but no one knows who is who, and so there’s a lot of double crossing going on. Too bad I can’t find out much about it on the internet.